Keiai Nautique landed his first grade-race victory in this year’s NHK Mile Cup. Debuting in June of his two-year-old season, the Deep Impact colt finished third in the 2017 Daily Hai Nisai Stakes (G2) in November prior to the Asahi Hai Futurity Stakes (G1) in which he finished fourth. Raced at a mile throughout his career, he registered a win in his second start as a sophomore and had come off a runner-up effort in the New Zealand Trophy (G2) for the NHK Mile Cup. Trainer Osamu Hirata claimed his fourth JRA-G1 title with the win—the latest being the 2017 Champions Cup with Gold Dream—while the NHK Mile Cup title was his second after with Curren Black Hill in 2012. Jockey Yusuke Fujioka, who came into the race with 28 graded titles since his debut in 2004, captured his first career JRA-G1 title. Keiai Nautique was unhurried after the break sitting well behind the race, second from last and still well behind while moving to the outside for a clear path entering the stretch. Despite having to cover much ground along the outermost route, the bay colt mowed down his rivals with great force and continued to increase his speed in the final strides to pin down Gibeon while holding off Red Veyron for a neck victory. “He was a bit slow to pick up speed so we had to race from behind, but he more than made up with his speed and sheer determination. His potential is so great and I think he can handle longer distance,” commented Yusuke Fujioka. Gibeon broke sharply and nicely covered between horses, settling in mid-division. As the field rounded the final corner, Gibeon responded instantly, split horses and pulled away with plenty of gas as some began to tire at the top of the stretch while just missing by a neck before the wire for second. Red Veyron, while having to race wide for most of the way after breaking from stall 17, made steady headway along the outside and exerted a fine turn of speed to threaten the leaders in the final furlong but was just short of reaching the top two for a close third. Race favorite Tower of London under Christophe Lemaire stumbled at the start and was rated a little further back in mid-field. Shifting to the inside along the rails rounding the third and final corners, the pair struggled to find a clear path which never materialized after entering the straight, and the two-time graded winner was pinched back behind a wall of horses in mid-stretch, lost momentum and faded to 12th. H. Fujiwara Shadai Race Horse Co., Ltd.
H. Fujiwara Green Fields Co., Ltd.
M. Nakauchida Sanshisuimei Co., Ltd.
T. Yasuda Danox Co., Ltd.
H. Shimizu Kanayama Holdings Co., Ltd.
R. Takei Ryotokuji Kenji Holdings Co., Ltd.
M. Nakauchida Sunday Racing Co., Ltd.
N. Hori Silk Racing Co., Ltd. While races in Japan for three-year-olds had been programmed mainly to facilitate those aiming towards the middle-long distance three-year-old Classics as typified by the Tokyo Yushun (Japanese Derby, G1, 2,400m), the interest in speed races is growing both within and outside Japan, and earning much respect as the traditional Classics. In 1996, JRA reorganized its races in order to accommodate and promote the three-year-olds suited to short distances, and established the NHK Mile Cup which was named after its sponsor Nippon Hoso Kyokai (Japan Broadcasting Corporation)—Japan’s only public broadcaster. The race was designated as an international race in 2009. Past NHK Mile Cup winners include subsequent derby winners King Kamehameha (JPN, by Kingmambo; ’04) and Deep Sky (JPN, by Agnes Tachyon; ’08) while El Condor Pasa (USA, by Kingmambo; ’98) and Kurofune (USA, by French Deputy; ’01) won the Japan Cup (G1, 2,400m) and the Japan Cup Dirt (G1, dirt, 2,100m), respectively. Katsuji came off a victory in one of two official trials for the NHK Mile Cup, the New Zealand Trophy (G2, 1,600m; Apr.7). Keiai Nautique and Delta Barows followed in second and third, respectively in the same trial while Kokura Nisai Stakes (G3, 1,200m; Jul.23) victor Cassius finished seventh. The other trial, the Arlington Cup (G3, 1,600m; Apr.14) was won by Tower of London who finished third in the Asahi Hai Futurity Stakes (G1, 1,600m; Dec.17) following his first career grade-race victory as a two-year-old. 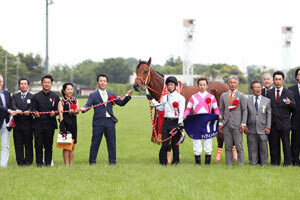 Runner-up Pax Americana and third-place Red Veyron also earned their berth in the NHK Mile Cup. Those that ran in the Oka Sho (Japanese 1000 Guineas, G1, 1,600m; Apr.8) but decided not to step up in distance in the Yushun Himba (Japanese Oaks, G1, 2,400m) and opted to aim for a G1 title over a mile against the boys included Primo Scene (10th) and Encore Plus (11th). Other key runners in the field were Tetradrachm, winner of the Queen Cup (G3, 1,600m; Feb.12), the Falcon Stakes (G3, 1,400m; Mar.17) victor Mr Melody and Frontier who was third, also in the Falcon Stakes. The race record is held by Danon Chantilly (JPN, by Fuji Kiseki) who covered the 1,600 meter distance in 1:31.4 in 2010.